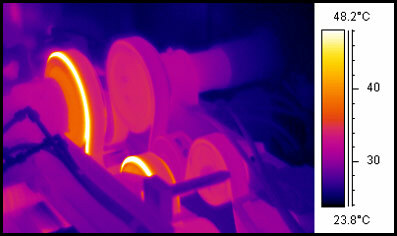 In all plants there are diverse collections of equipment that can be successfully inspected using infrared thermography. For most mechanical equipment the techniques used to inspect the equipment are straightforward, but specific knowledge and experience with some equipment is often required. You should know the basic operation and heat flow characteristics of the machinery, understand heat related failure mechanisms, have safety inspection procedures and observe the machinery during start-up and cool down as well as during normal operation. No one knows the equipment in a plant better than the plant personnel themselves do. 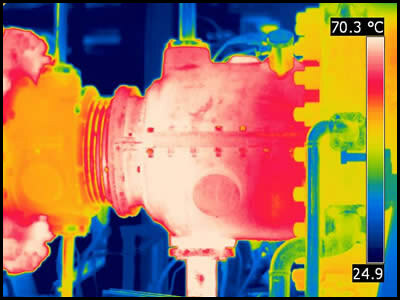 It is very helpful to have past experience with the equipment and thermal images of the equipment during normal operations. 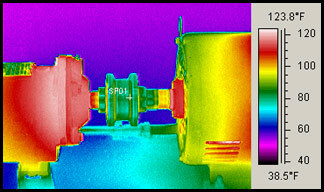 Rotating mechanical drives on vessels are a critical part of equipment. We are able to identify failing bearings, couplings and misalignments allowing repairs to be made prior to a catastrophic failure. Worn bearings and mis-aligned pulleys can cause unexpected downtime usually at periods when it is least expected and highly unwelcome. We can predictively identify areas of potential problems and literally see it before it becomes a problem! Predictive maintenance demonstrated. components apparently due to misalignment.